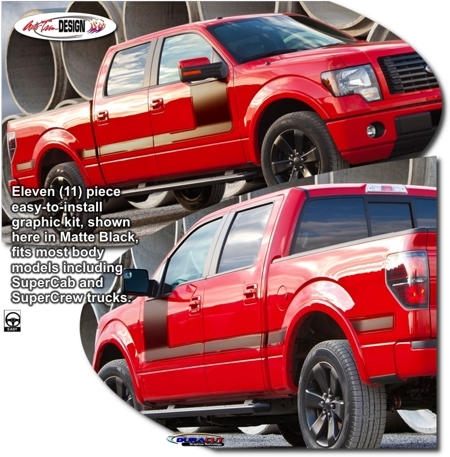 Make your '04-'14 Ford F-150 stand out from the rest with this great-looking Body Side Graphic kit. Kit is PRECUT and ready to install in a wide variety of colors1. Slight trimming required at Rear Door jambs as well as Cab/Box connection2. As you can see, graphic package is not just a generic set of stripes. Kit is specifically made for the '04-'14 Ford F-150 and will not fit any other vehicle. 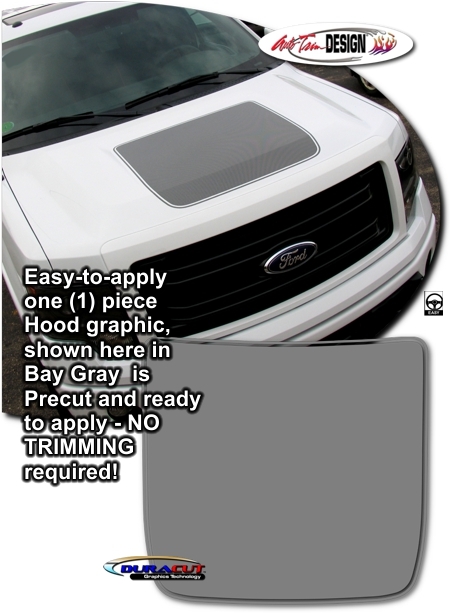 1 Ford’s F-150 FX4 stylized graphic consists of a dot matrix pattern on a transparent film with a satin finish. Kit offered herein is manufactured with automotive grade premium cast film in solid colors - with no dot matrix. 2 Graphic kit has been configured to fit SuperCab, SuperCrew as well as Long Box model combinations with slight trimming required at Rear Door jambs as well as Cab/Box connection.